There won't be as many shells fired this year for the Hailey Fourth of July fireworks extravaganza, but spectators nonetheless can expect "more bang for the buck," said Hailey Fire Chief Mike Chapman. "People shouldn't be able to tell the difference between this year and last year," Chapman said. "It should be just as spectacular." Expect the show to begin around 10:25 p.m., "give or take a few minutes," he said. 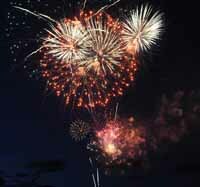 People can catch another fireworks display a couple of days earlier in Sun Valley. Expect that show to begin around 10:30 p.m. after the Sun Valley Ice Show on Saturday, July 2. Chapman said the Hailey show will have about 500 shells, down from about 700 last year. However, this year's fireworks are on the average larger in size. "Less the quantity, a little more the quality," he said. Lantis Fireworks & Lasers, from Draper, Utah, is once again contracted to do the show. Chapman and the Hailey Fire Department will provide safety and security with the assistance of law enforcement. Chapman asks spectators to leave their own fireworks, especially the illegal ones, at home. "I hate to say it, but we don't want it to be like Beirut," he said. Chapman said the show will likely last about 17-18 minutes. "No matter how many shells you have, in the fireworks business, they say never less than 15 minutes and never more than 20 minutes. Otherwise, it's not enough or you get sensory overload." The fireworks will be fired, as in the past, near the football field at Wood River High School. Chapman said high school parking may be restricted because of construction work, but should be available at the nearby Community Campus. The Hailey Chamber of Commerce advises spectators to walk, ride bikes or take a Mountain Rides bus to get to the show. In previous years, traffic exiting the area following the show has been very slow. The chamber also reported that fireworks will be accompanied by music provided by the 25th Army Band from Boise. The show will cost about $20,000 to put on, which is the typical price for the Hailey event. Funding is in part by the city of Hailey and in part through private donations. The exact split was not made available. "That's the best-kept secret in Hailey because I've never heard what it was," Chapman said.